I’m so excited to be presenting a new tutorial for you. I’ve had to squeeze it in between lots of crazy work/house stuff, but it’s done. And, I think its pretty cute! 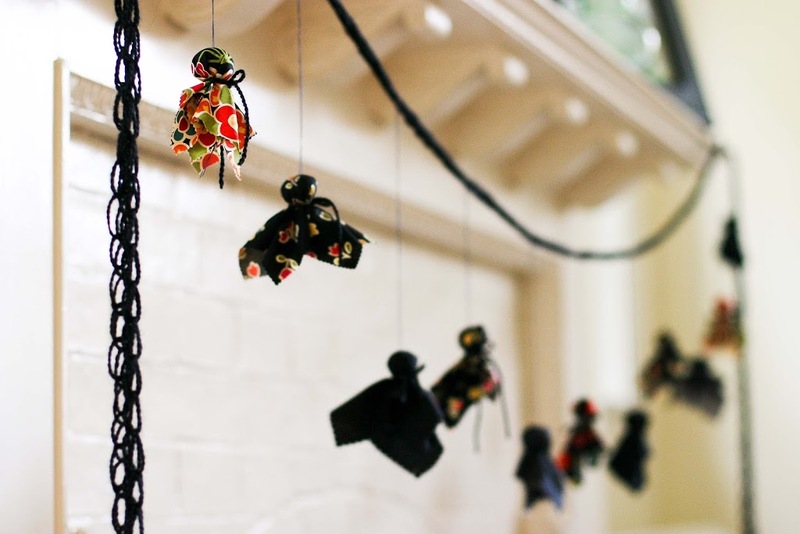 It is a collection of sweet black ghosts on a decorative strand of finger-knitting. 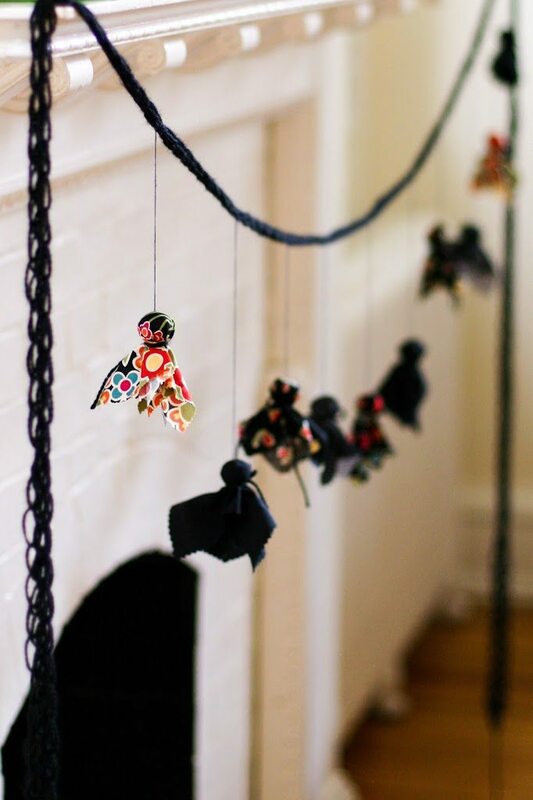 A ghost garland–yes. And, no, I haven’t gotten sick of a good garland, yet. 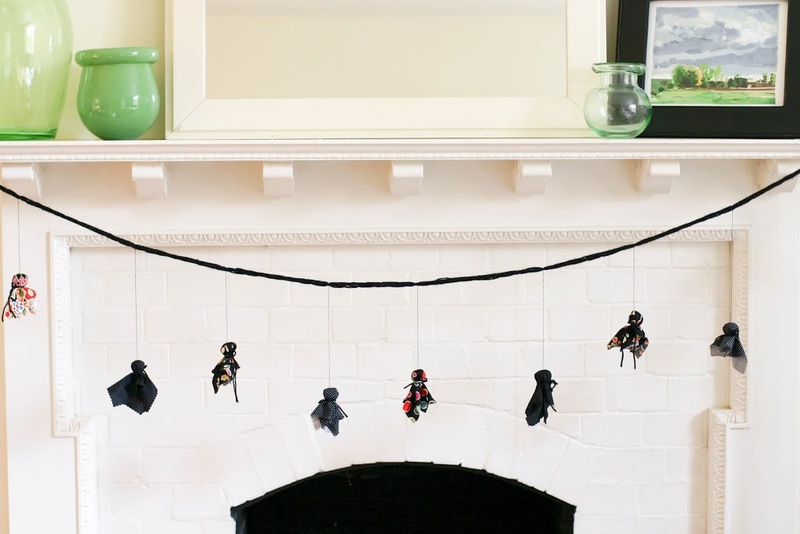 I think this would be really cute over a festive Halloween table, or strung across an entry or mantle. 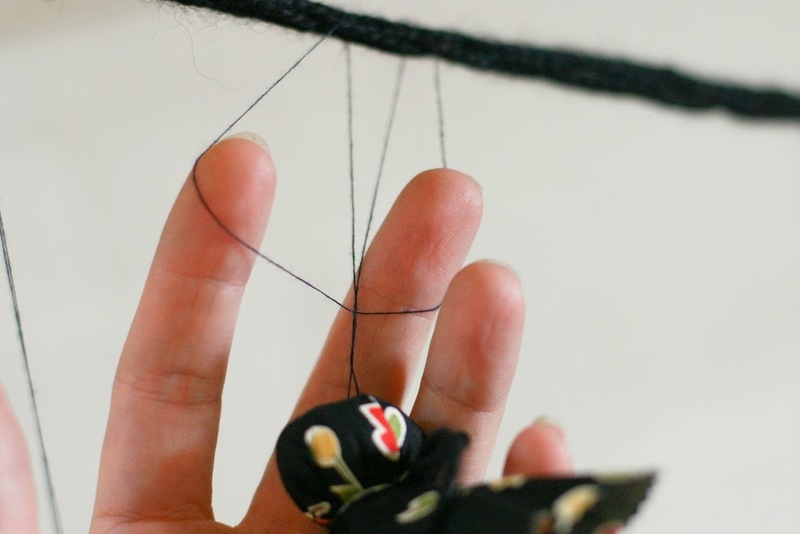 Finger knit a chain with black yarn. For instructions on how to finger-knit, go here. 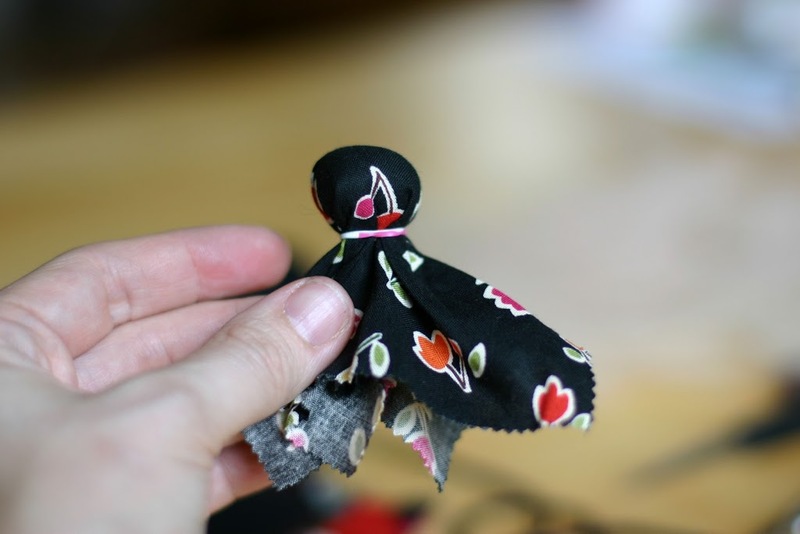 Cut desired number of five-by-five inch squares of black fabric with pinking shears. 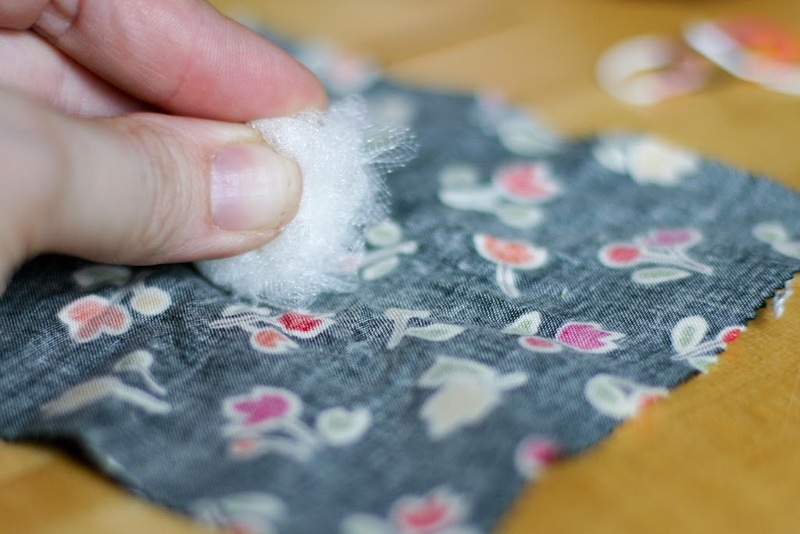 Ball up small amount of tulle or other stuffing. 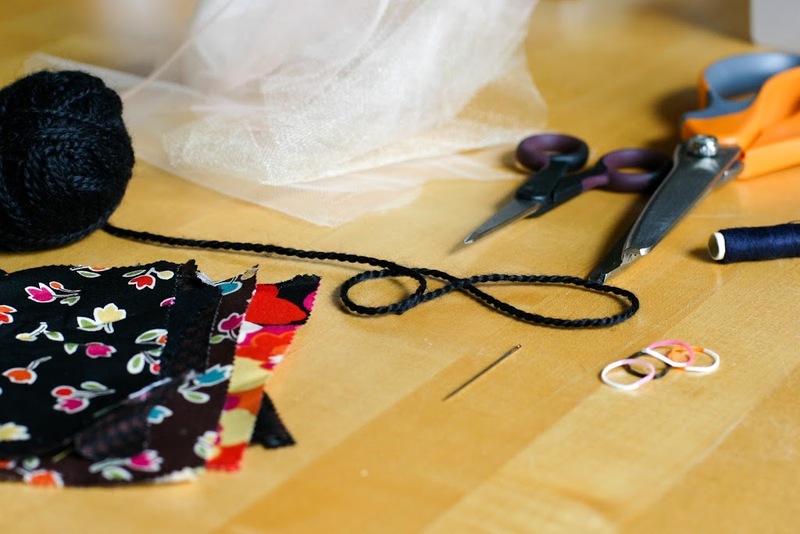 Make the ball about an inch in diameter and place stuffing ball in the middle of square of fabric. 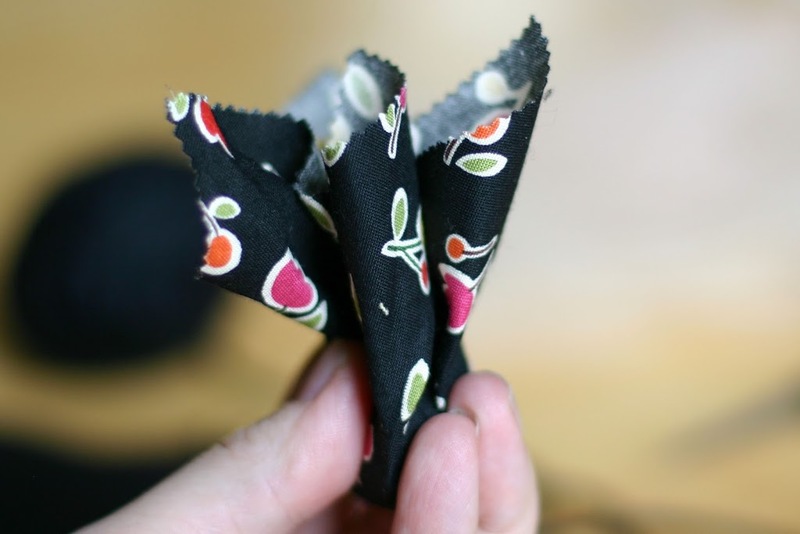 Scoop fabric over ball (head). Secure an elastic over the head. This step isn’t entirely necessary. You could go straight to tying with the yarn, if you want. 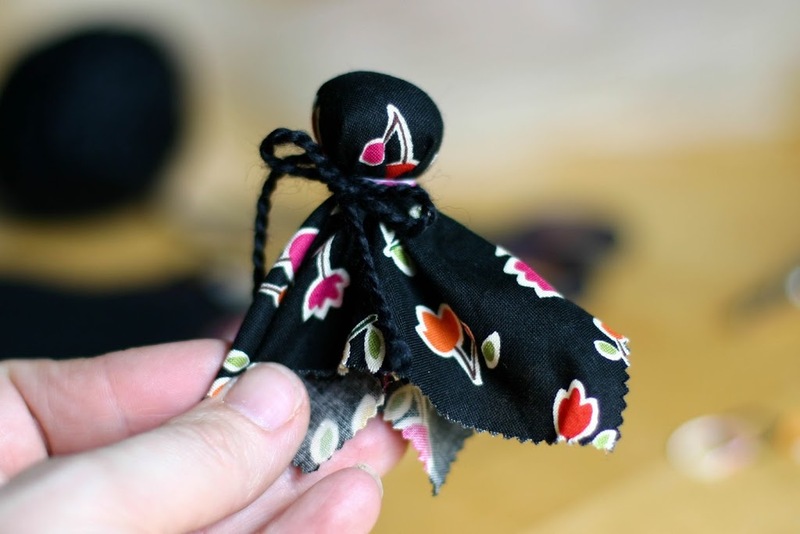 The elastic just holds the shape of the head easily while you tie the yarn around the neck. If you found black elastic, you could skip the yarn step altogether, if you want. 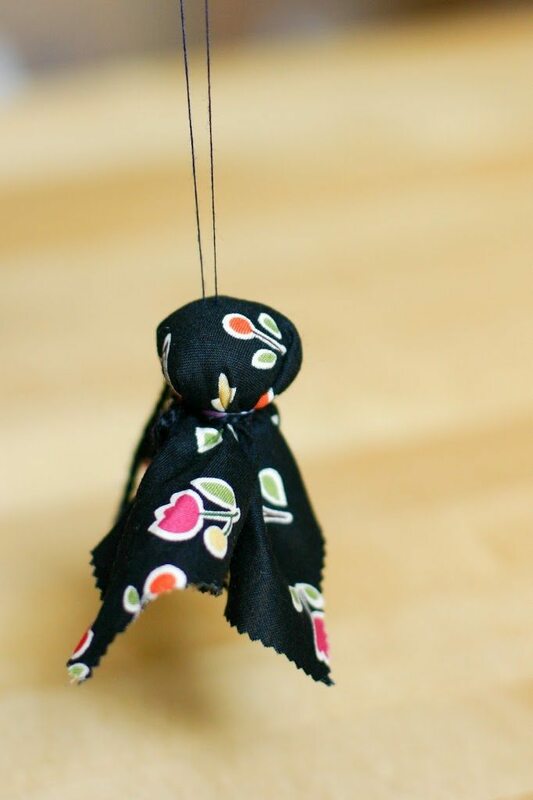 Tie a piece of black yarn around the neck of your ghost. 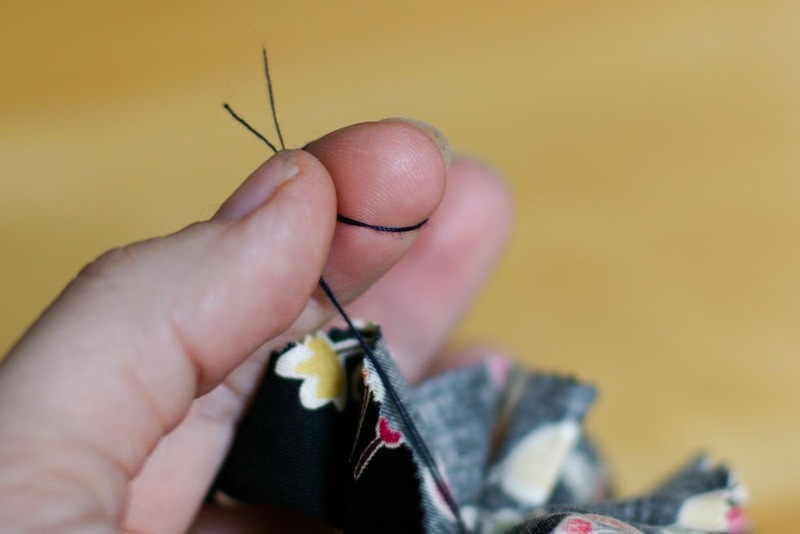 Thread your needle with black thread. Bring the needle up from underneath the bottom of the ghost and through the top of the head. Leave a loop at the top of the head and bring the needle back through the top of the ghosts’ head. 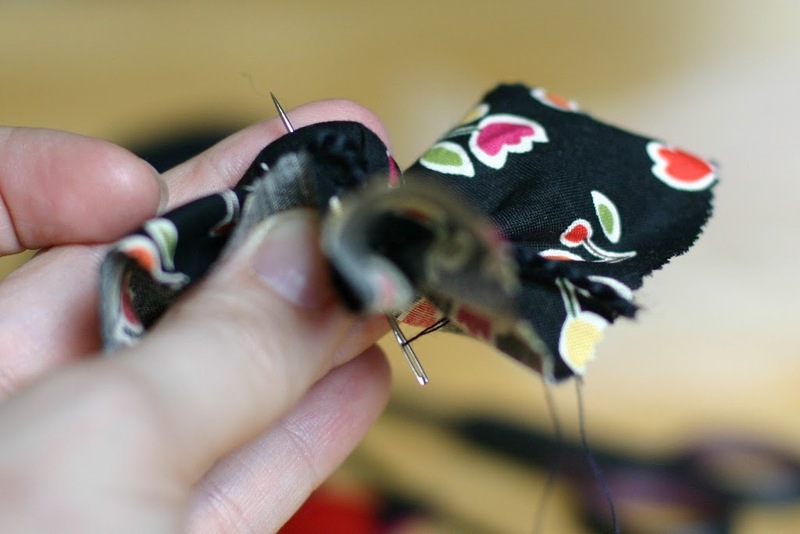 From underneath ghost, line up the two ends of thread and tie in a simple knot. Now you have your first ghost. Repeat process as many times as desired. 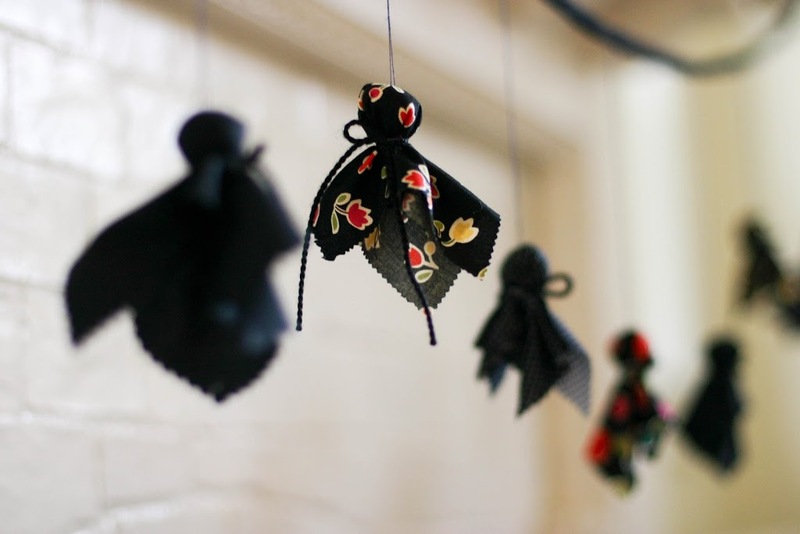 Vary the length of thread you use, so the ghosts don’t all hang at the same height. I made around a dozen ghosts. 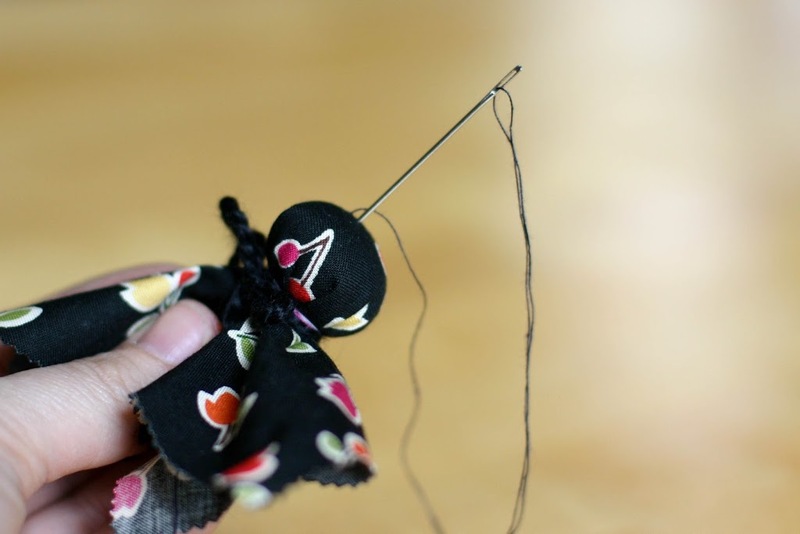 Add your ghosts to the line of finger knitting by attaching like you would attach a tag. 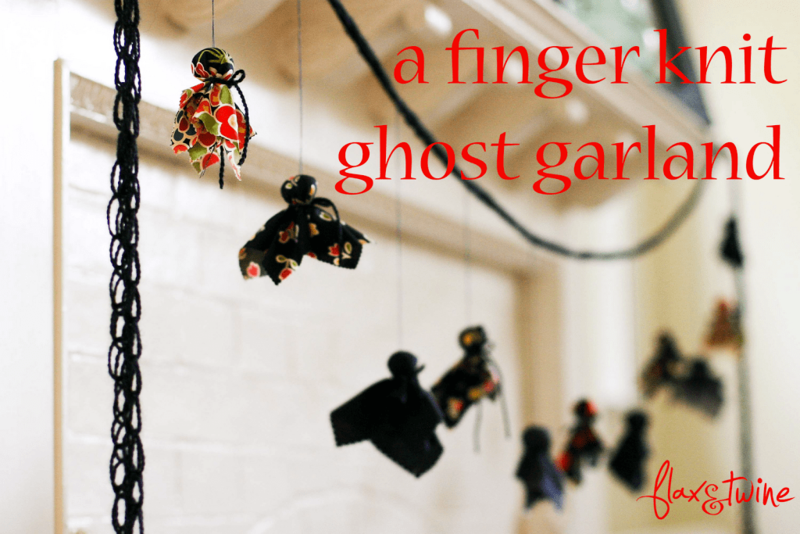 Wrap the loop around the strand of finger knitting and pull the ghost through the loop. This way you will be able to adjust the positioning of the ghosts as you see fit. I’m a huge fan of this cheery, though black, collection. Bonus, I think it will last balled up in the decorations box till next season too! This is easy enough to whip up in a short period of time. Do it this weekend! Happy Halloween! Adorable! I taught my 5 year old niece to finger knit when she visited last summer. I used the instructions on your site and she loved it. She took home a VERY long hot pink garland to put up in her room. Great to hear Claire! I’m sure she loves it! What a fun garland. 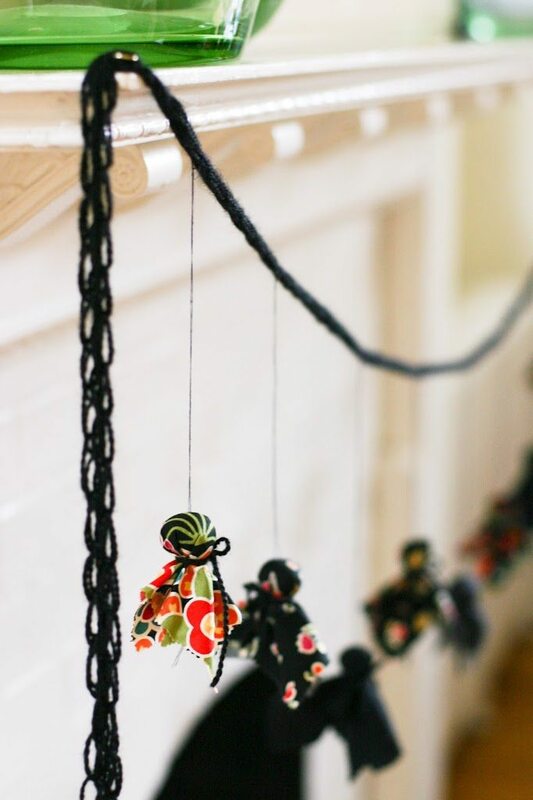 I’ve been wanting to learn to finger crochet, and a garland seems like the perfect project to start with! Kate, what a kind comment. Thanks for taking the time to leave it. It has made my day! I love this! Too precious! Just over from Wild Olive today. Thanks so much Sarah. So glad you popped by for a visit. I appreciate your taking the time to leave a comment.